This post was written in exchange for products from Beauty Counter, however, all opinions are my own. As a mom, it is important to me that my morning "beauty" routine is quick and easy. As a woman, it's important to me that this same routine is one that supports my body in a natural way. I am all about utilizing the bare basics on the daily. And by "bare" I mean, simple, but also clean, without any harsh and potentially toxic chemicals lurking in them. If you haven't ever visited the EWG's Skin Deep Cosmetics Database, I would highly encourage you to head there and search the products you are currently using. It will break them down by ingredient and tell you what health impact each may have. The results may surprise you. That being said, the following are a few of my favorites, filled with only the good stuff, for getting my day started off on the right foot. My hands down, absolute favorite toothpaste is Young Living's Thieves Toothpaste. It has no fluoride, synthetic dyes, artificial flavors or preservatives and is created with their popular Thieve's blend of essential oils which not only supports my teeth but my overall wellness as I brush. I also recently started utilizing this charcoal infused bamboo toothbrush from Leafico. With this guy, not only was I able to ditch my former plastic friends, but also benefit from the properties of charcoal in my bristles to promote all natural whitening of my teeth as well. Two of the products I use on the daily are from Beauty Counter. Which if you haven't heard of this company yet and are looking to make a switch to more natural beauty products, it is a sure bet. Their mission is to truly create safer personal care products for women by eliminating so many of the chemicals that can be found in conventional ones stocked on our store shelves. I purchased their Texture Sea Salt Mist recently and have been loving it as a replacement for products like mousse or hairspray. I just spritz my hair with it when I get out of the shower each day, and give it a little crunch, and I'm good to go. It's incredibly low maintenance, which I appreciate, and the key ingredients of red algae extract and pink himalayan sea salt help to not only protect and restore, but to add texture and volume to my hair as well. I've also been using their Charcoal Cleansing Bar now for quite some time as my go to cleanser. It's made with charcoal, anti-oxidant rich organic green tea and organic coconut oil, and it's been a must have addition to my daily skin care routine as it not only cleans my skin, but hydrates it versus drying it out. If you are interested in either of these products or checking out more of what Beauty Counter has to offer, feel free to head to either of these links from my girl Rachel Madden who is not only an incredible woman, mom and clean beauty advocate, but my go to gal (and consultant) for all things Beauty Counter. 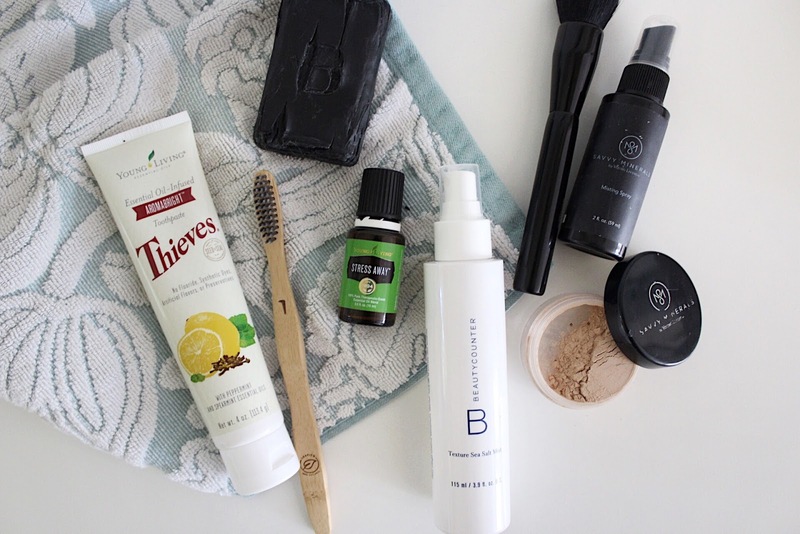 Alright, so I already sang the praises of Young Living up above a bit with my toothpaste horn tootin', but did you know they also have a line of makeup that is not only high quality, but created with only the cleanest and purest ingredients? Savvy Minerals is a mineral based makeup line that contains not only naturally derived ingredients, but also a variety of powerful essential oils. The line has everything from foundation, to eye shadow to lip gloss and in between, and it continues to expand. While I don't generally get "dolled up" on the daily, I do love most days to just put on a little foundation before heading out and about. I not only love the ingredients in the Savvy Mineral's foundation, but I also love that they have created it to be utilized hand-in-hand with the misting spray you see pictured to help apply it more smoothly. I usually just sprinkle a little into the lid each morning, give my foundation brush a good spritz or two, and it goes on like butta'. But seriously, for someone who seriously lacks any makeup application skills - this is a product I can not only support - but handle each day! Finally, no morning would be complete without the goodness of essential oils. While I definitely use a variety of oils throughout my morning and day for multiple purposes, Stress Away, is like "Old Faithful" to this mama. I've got a roller ball on the top of my bottle so I can easily just roll it on my wrists and the back of my neck each morning as I get ready to conquer the day. With oils like lime and lavender, combined with vanilla extract, the aroma is seriously just straight "soothe me" in a bottle. If you are interested in any of the Young Living products like the Thieves line, Savvy Minerals or any and all things essential oils, I'd love to chat with you more about how these items can be incorporated into your own daily routine as well! And if you already know you are ready to jump on board with any of them, I'd love for you to use my Young Living Member Link and join the awesome community of incredible, natural minded women and mamas like myself.